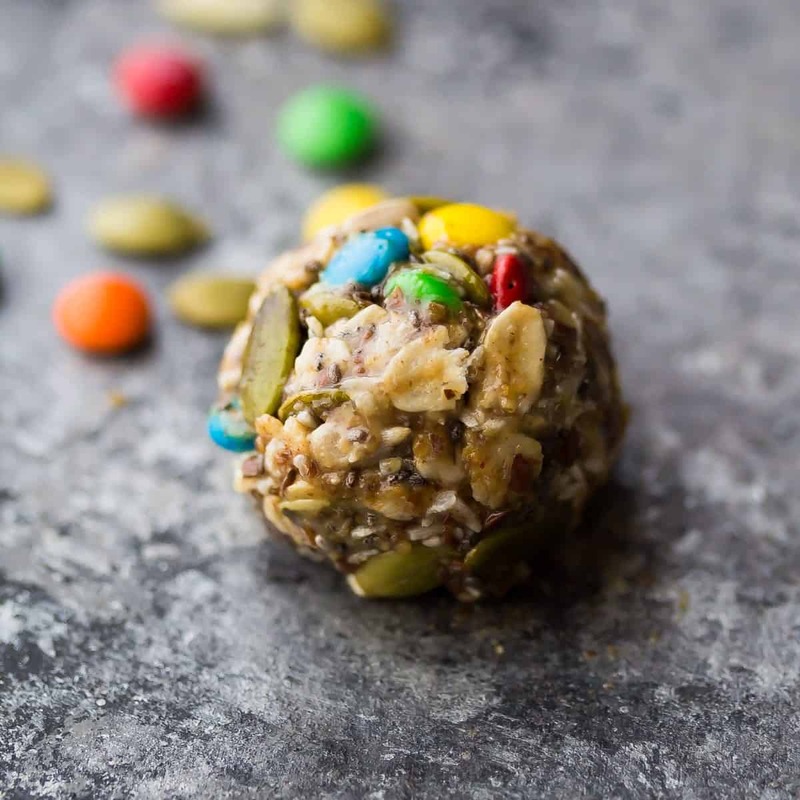 SEVEN delicious no bake energy bites! 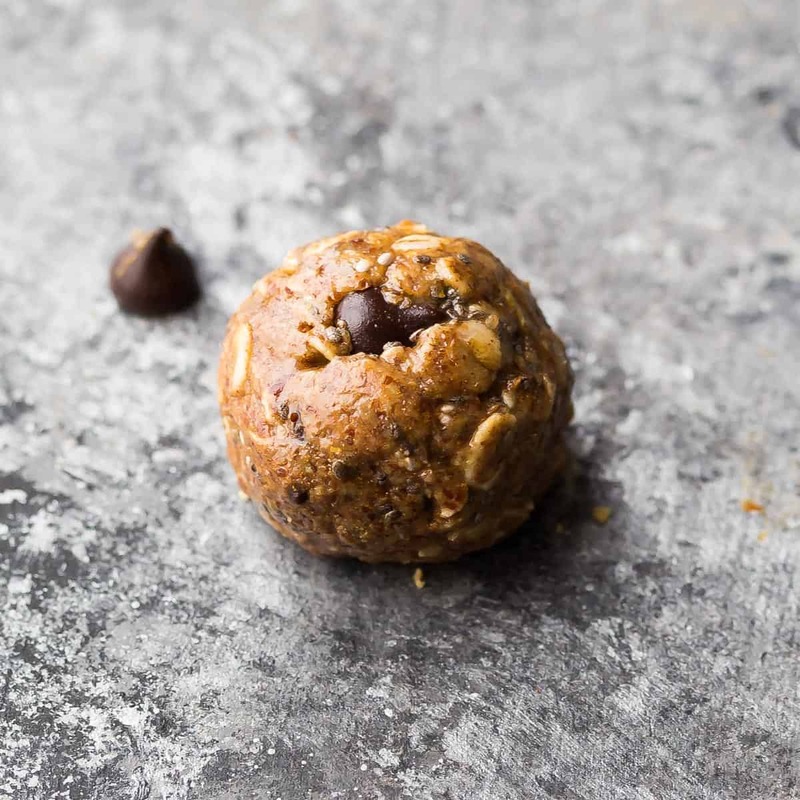 These vegan, gluten-free, high protein snacks are perfect to prep ahead and stash in the fridge or freezer. 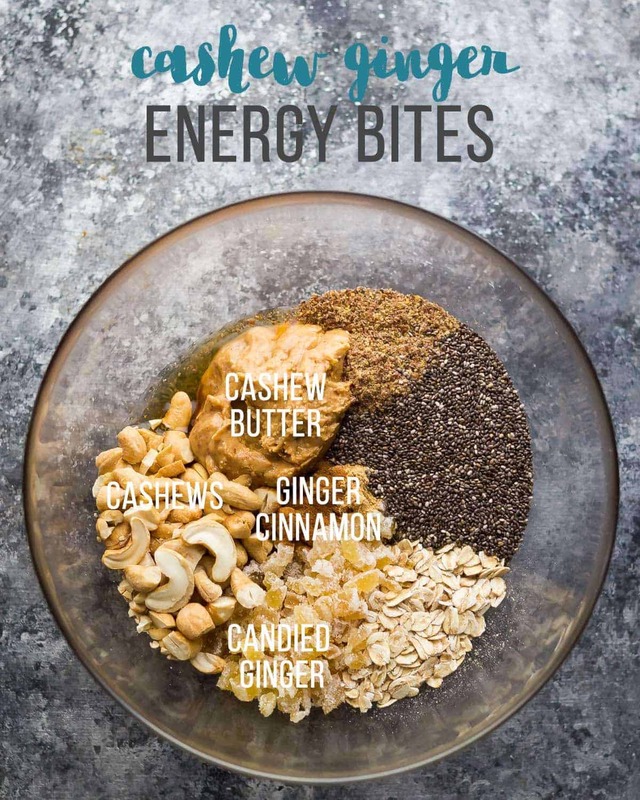 NEW: get a free printable with all seven energy bite recipes here! 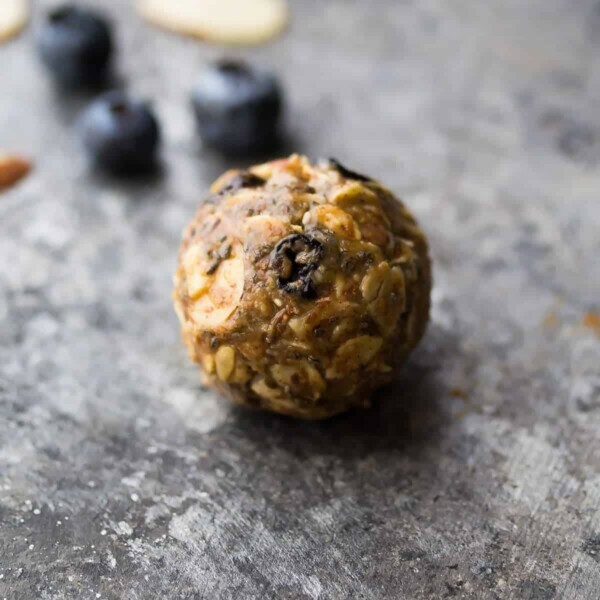 What else to love about these no bake energy bites? you can go crazy with add-ins and make these your own! Stir in the nut butter, maple syrup (or honey) until smooth. 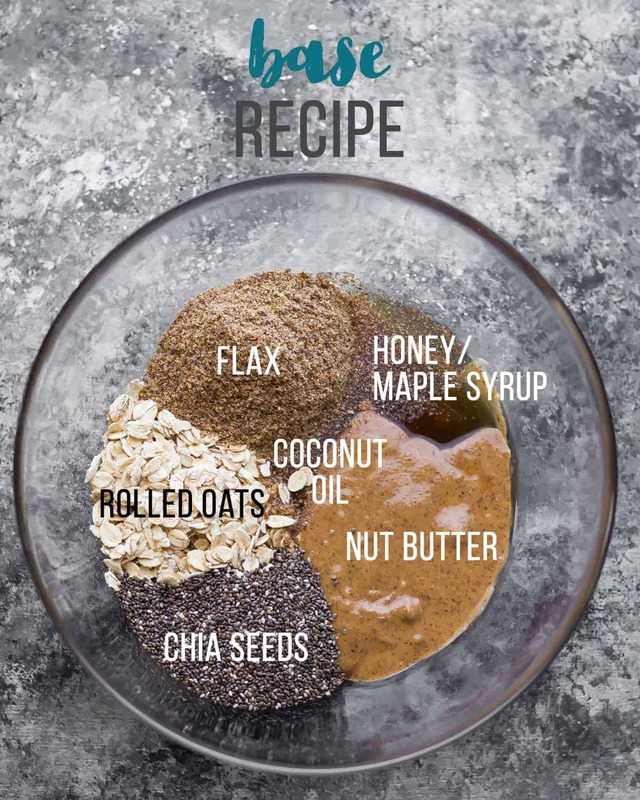 Add the oats, chia seeds and ground flax, plus extra add-ins. 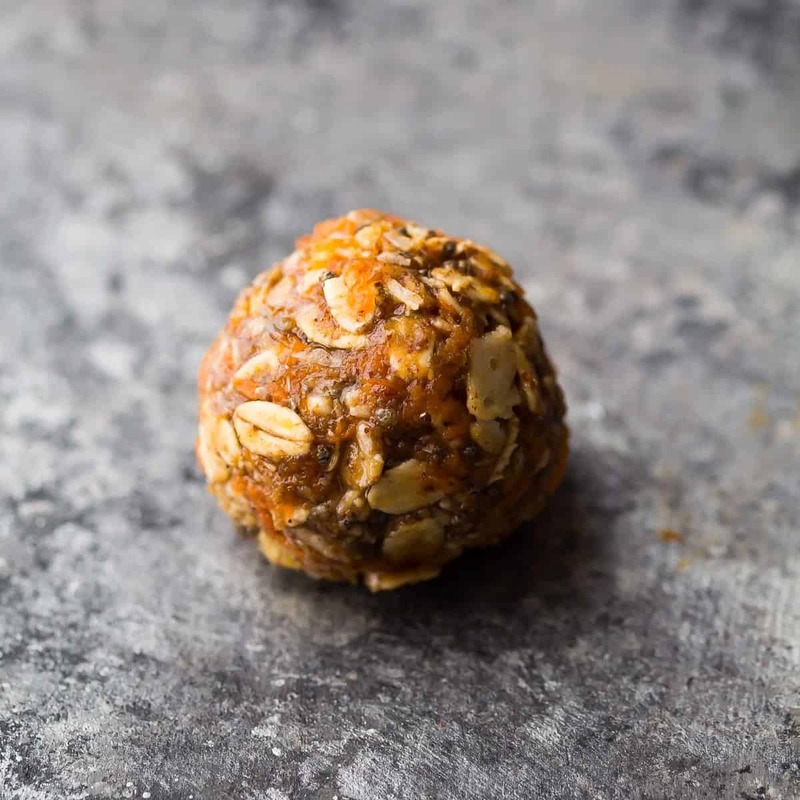 Roll into 1 tablespoon balls and store in the fridge for up to 1 week or the freezer for up to 3 months. I made the carrot cake bites and they taste delicious, but they are a little too moist for our liking (wet to the touch). The balls are in great shape though and have stuck together beautifully. Are the balls supposed to be this moist? I was thinking of adding more oats next time to soak up all the moisture from the carrots. Thanks for the recipes, I’ll be trying most of them! Hi Sarah! They shouldn’t be moist. If they are too sticky to roll, definitely try adding in some extra oats next time! Terrific recipes! The one I tried so far is the cranberry lime. It is absolutely incredible! I am going to try the blueberry next-cannot wait to eat these! I’m so glad you enjoyed! Hope you like the blueberry ones too! How long can you keep the energy bars for? And where is it best to place them ? Hi Baw! These must be stored in the fridge as they get soft. You can also freeze them! They are good in the fridge for a week 🙂 Hope you enjoy! Hi Emily – I made the cashew ginger ones. I love the flavor of the mixture. I can’t seem to get them to hold together in balls they just sort of fall apart. What am I doing wrong? Hi there! Just want to make sure I’m understanding correctly…I want to make the Carrot Cake bites….am I supposed to use the “base” measurements plus everything listed under the carrot cake section? Just unsure if I’m supposed to double the amounts for coconut oil, almond butter, rolled oats, etc. Hi Jess! No, just follow the directions/ingredient measurements under ‘carrot cake bites’. The base recipe is in case someone wants to make a plain batch or try with their own add ins 🙂 Hope you enjoy! 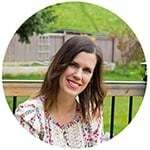 I have family members who can’t eat chia seeds – do you think the recipes would work if I substituted ground flax for the chia (in addition to the flax in the base)? And if yes, would you use 2 T. or less? All the flavors sound delish! Thank you for working up these terrific recipes! Hi Cathy! 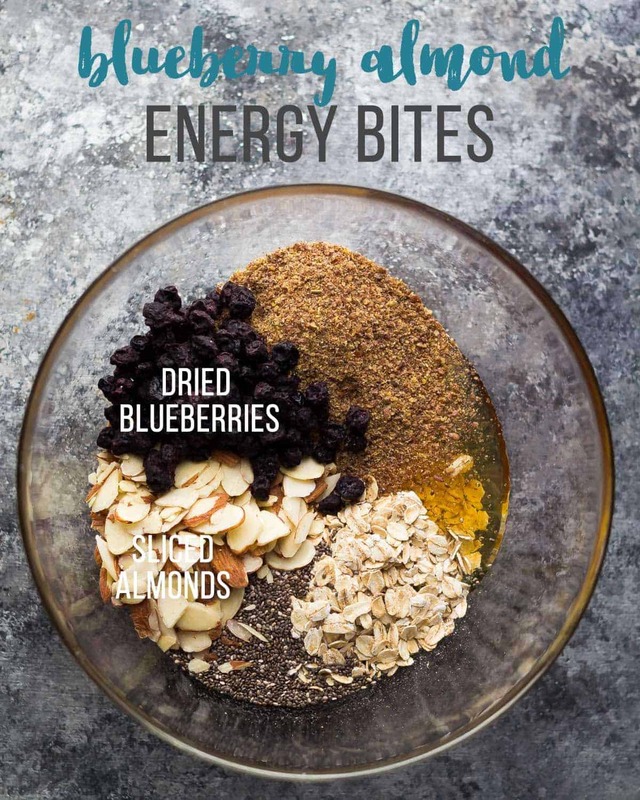 You can leave out the chia seeds, no need to add extra flax. I worry that if you add extra flax they will be too dry to roll. Hope you enjoy! Oh, my goodness. The lime cranberry ones are a flavor explosion in your mouth! The fresh lime peel is just amazing in these. I will be trying some lemon zest in the blueberry ones next time!! This is my first visit to your website and it is wonderful. 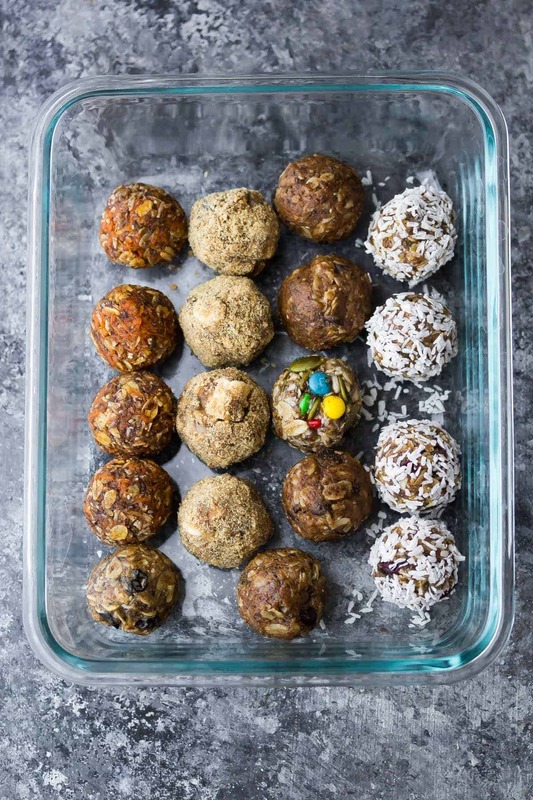 I do have a question however; I am allergic to coconut so what would you recommend as a substitute when making energy bites and protein bars? 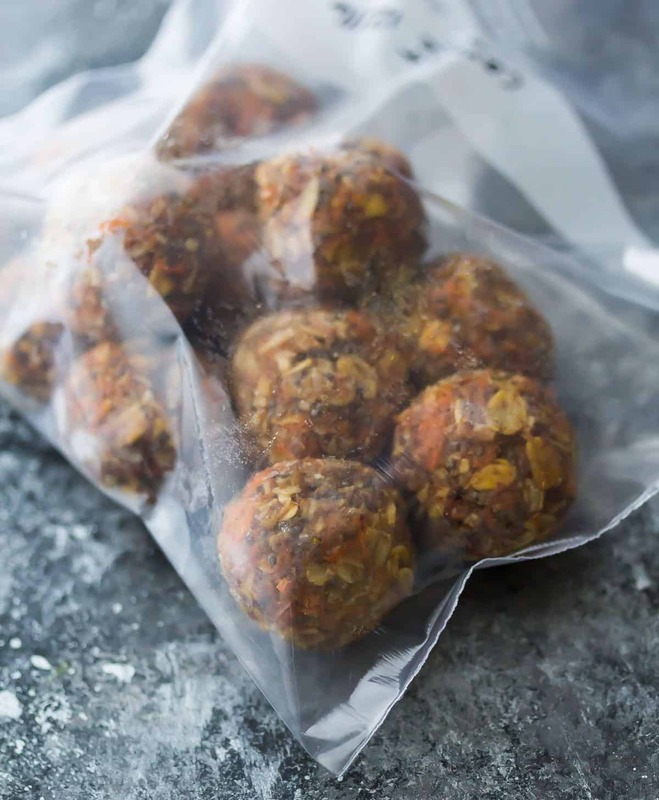 I’m hoping to make a version of these for backpacking, but am unsure due to the requirement of refrigerating to store… would these be ok for a couple days on the trail? Is the refrigeration for storage just to keep the coconut oil solid? Thanks! Hi Tiffany! 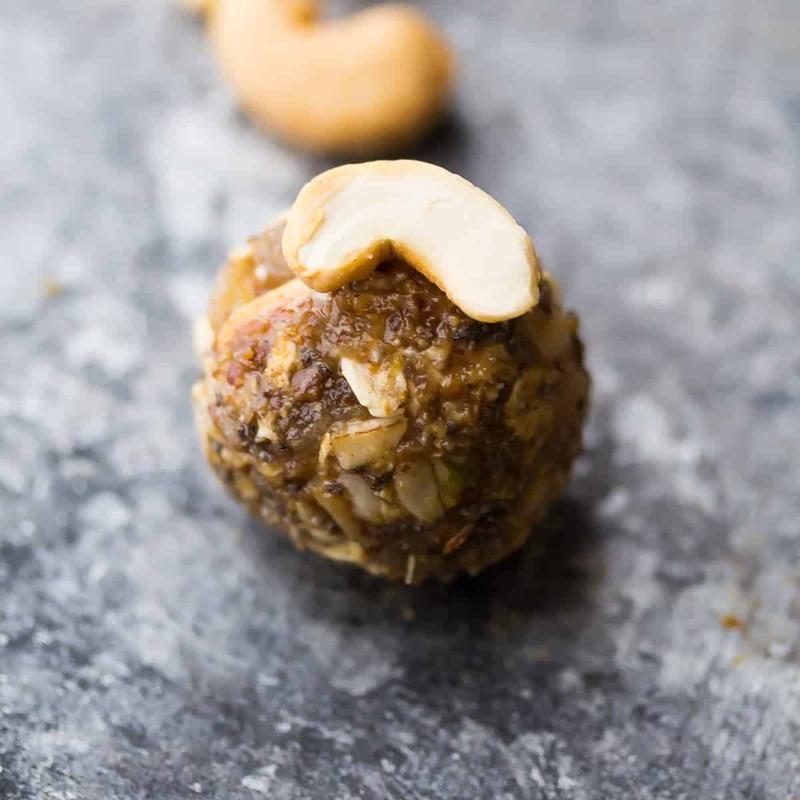 These energy bites do need to be refrigerated as the nut butter gets really soft at room temp and they can become mushy. Hi! I was wondering if you think quick oats would work in place of the old fashioned? They’re what I have on hand… Or will they not have enough structure? Hi Lindsey, I think they would work OK, but I haven’t tried. Let me know if you give it a try! I did try it and they came out awesome! Thanks for the great recipe! I’m afraid that marshmallows are neither vegan nor vegetarian, as they contain gelatin. Fortunately, vegan marshmallows do exist. You may want to specify vegan marshmallows in the recipe. Just made the banana pb onea & the carrot cake ones. Perfect!!! Super yummy!!! & so wonderfylly fulling!! Thank you so much for the recipes!!! I get my peanut butter and almond butter at Winco. You make it yourself in the bulk department and it’s nothing but the nuts ground up. I absolutely love these. The print button in every energy bite recipe except the base recipe is not working. I got around it just saving the whole side but you might want to look into it. Hi Jessica! That’s so strange, I’m not having any issues printing any of the recipes. What browser are you using? I made the carrot cake ones, but they are so soft! They are not hardening up in the fridge. Are they supposed to be super soft? Hi Melanie! They may be soft just after you mix up all the ingredients (especially if you melted/softened your coconut oil & nut butter). Sticking the mix in the fridge for an hour or so really helps firm it up and makes them easier to roll. Let me know how it goes for you! I’m trying to print these and it comes up with page not found. Hi Emma, I’m so sorry about that! I am just seeing this too. I have just switched recipe card plugins and will contact their support team to get it fixed asap. So sorry for the inconvenience! So happy you like them, Patti! 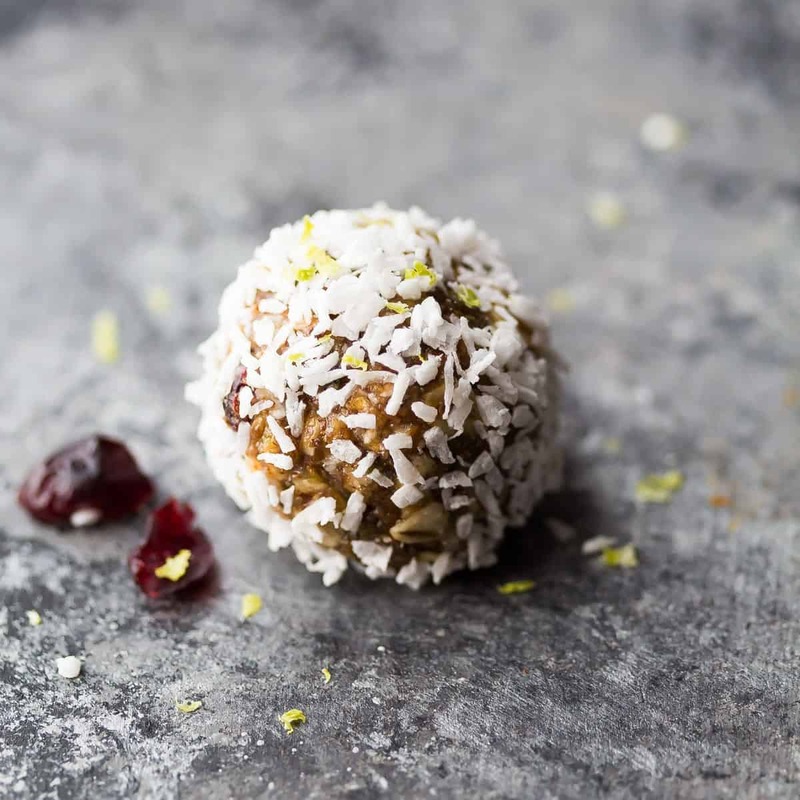 My children are obsessed with the cranberry bites (although we make them without the lime zest); they even prefer them to sweets and chocolate! Very easy to make and very tasty – just sweet enough to sooth any craving but not too sweet at all, and also quite filling. We make them a bit smaller (bitesized) and two at a time are more than enough. I have made two different types of this recipe. Both the basic energy bite and the dark chocolate mocha. Both were delicious. My only hurdle with these is other than myself everyone in my family hates coconut in any form. I love having these around to snack on. Just one or two are enough to fight back the cravings. I love all of these combos! I love the Trail Mix ones the most! This were so good. I made a variety of the recipies in this post and they didn’t last long in my fridge. 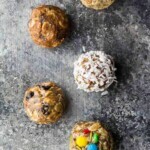 My kids and hubby usually pass when I make different/healthy snacks but they didn’t pass on these ? I’m so glad you and your family enjoyed them Lisa! 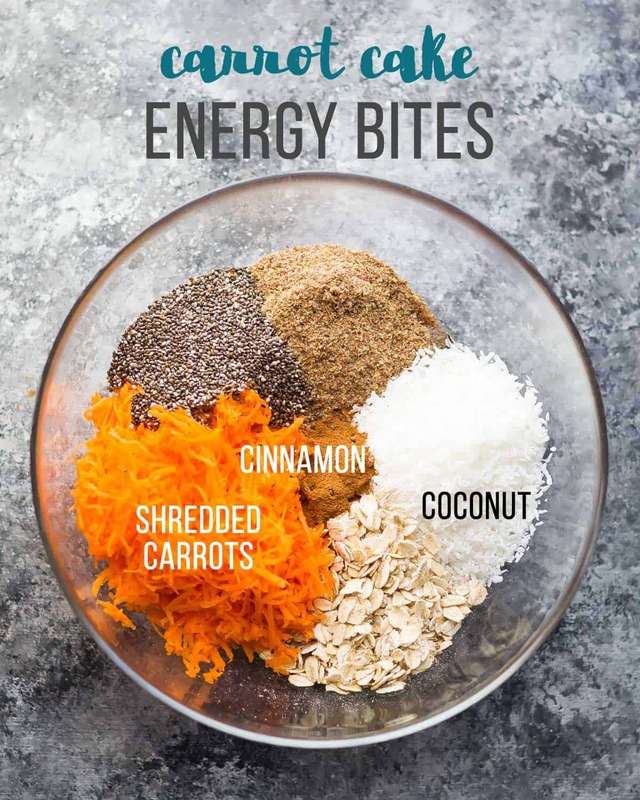 This is my favorite energy bite recipe! I’ve tried the cranberry, lime and coconut (actually used lemon instead of lime because that’s what I had and they were great! ), carrot cake, and s’mores. This weekend I’m going to make the trail mix ones. They are also a hit with my 7-year-old son! I made the Carrot Cake Energy Bites. I liked them! But just to double check with you: on the ingredients list, the recipe calls for 1/4 cup of shredded coconut; but looking at the instructions, it says 1/4 cup in the mix and another 1/4 cup at the end. Thanks for catching that Audrey! It shouldn’t say to roll them in the reserved coconut, and I’ll modify the recipe ASAP. Thank you! I made the s’mores ones with peanut butter and they were awesome! Satisfied my sweet tooth without eating horrible! I made the carrot cake ones last week and they were so delicious! They are great for avoiding something sugary and unhealthy when you get a craving for something sweet. 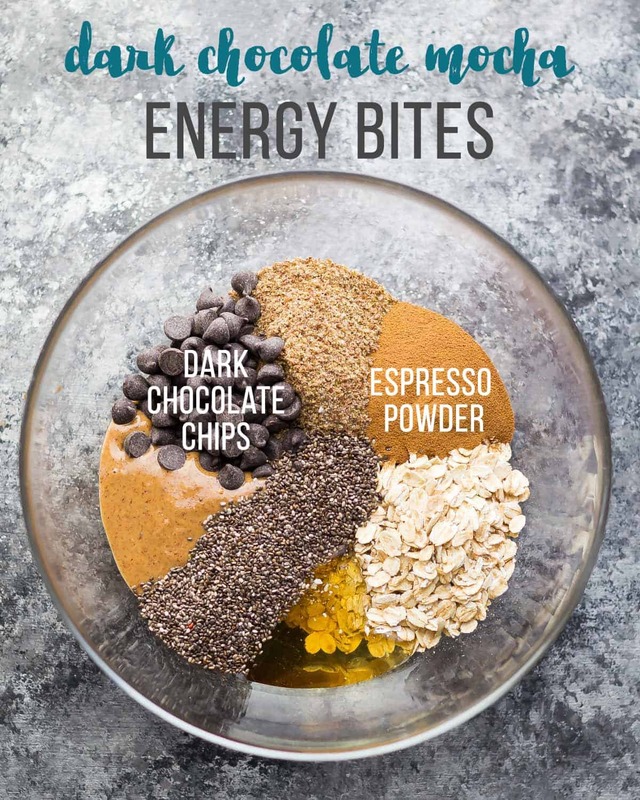 I would like to try the Dark Chocolate Mocha Energy Bites, but I’m wondering if you used the instant espresso powder, or just regular espresso (finely ground coffee beans)? Hi Jiveney! 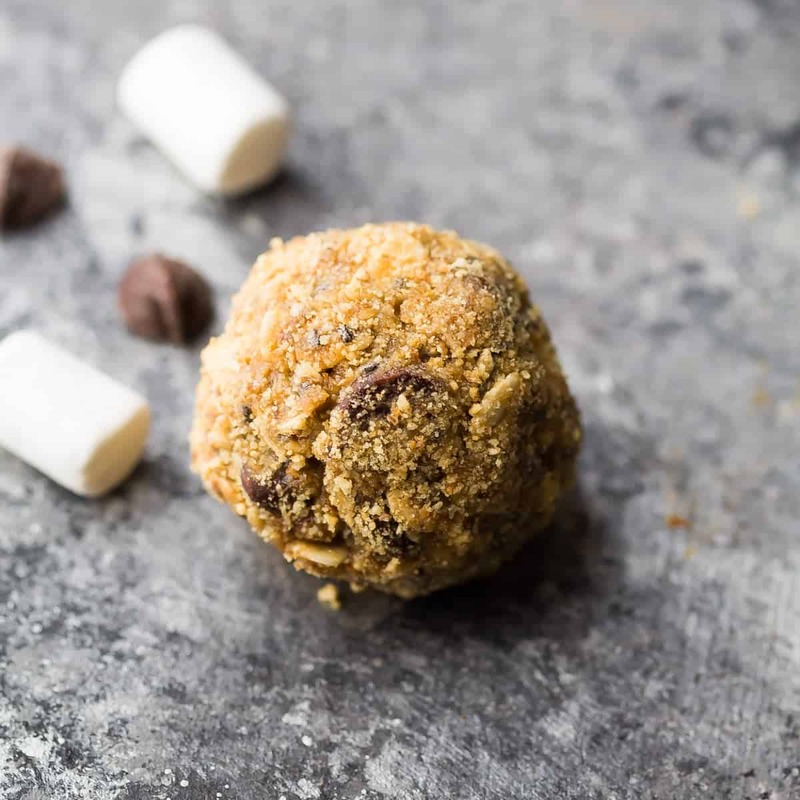 I’m so happy you liked the carrot cake energy bites 🙂 I used instant espresso powder for the dark chocolate mocha ones. I haven’t tried using regular ground espresso, and can’t say for sure how they’d turn out. If you try them, would you let me know how they turn out? Hi Janna, I’ve never used grapeseed oil or any oil other than coconut oil. If you don’t want to use coconut oil you can always use an extra tablespoon of nut butter. I hope this helps! These look delish and I can’t wait to make them. is there any way I can submit rolled oats for something else? I’m not a big fan of uncooked oats. Or is there a way i can cook them up some how? Hi Mary, unfortunately these can’t be made without the rolled oats, at least I’m not aware of anything you can sub the oats with. Any thoughts on something I could use instead of coconut oil and shredded coconut? I’m really not a fan of coconut but don’t want to end up with crazy dry bites by just leaving it out! Hey Ali! 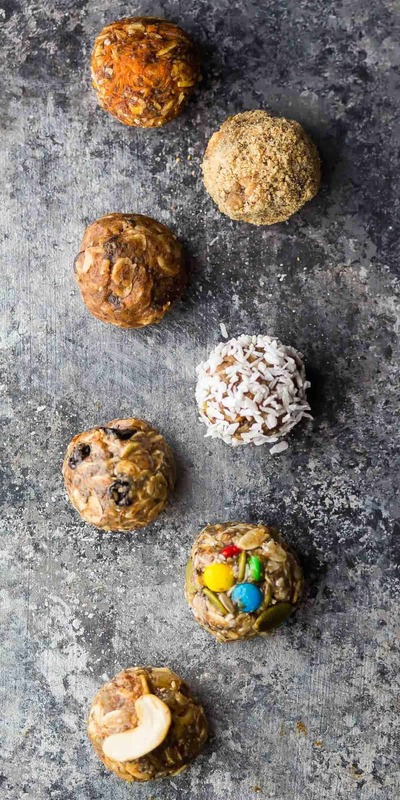 You can sub the coconut oil with an extra tablespoon of nut butter and you can sub the shredded coconut with 1-2 extra tablespoons of rolled oats. Hope you like them! I can’t wait to try these. On the serving question. I see how many servings it makes but what are your counts and how many should you eat at a time? I would probably use this after a workout so how many is 1 serving? 1-2? Hi there, I’ve made the base recipe a couple of times as it’s delicious on it’s own however I’ve never been able to get the mix to come together as balls. I’ve tried adjusting the ratio of wet to dry ingredients to no avail. Any tips? Thanks. Hi Ruby! I’m so sorry it’s not coming together for you. Could you tell me what you’re using for nut butter? Is it natural? I had that problem too. I used a melon baller tool to get out the amount I wanted to use for each ball and warmed that in my hand a little bit. While doing that, add a little pressure so the mixture sticks together better. I am wondering if it would be easier to roll them into balls without refrigerating the mixture. I don’t really get the reason for refrigerating the mixture before rolling. Most butters solidify when cooled making it harder to use, so keeping the mixture at room temperature makes sense to me for rolling the balls and then put them in the fridge. Hope this helps. Hi Jennifer, if your mix is too crumbly, then you’ll want to add more nut butter or coconut oil, and chilling won’t help you. However if your energy bites are too liquidy, then chilling definitely helps them set up and roll better. I’ve found that oil/liquid content seems to really vary between nut butters and different brands. Could Sunbutter be used instead of a nut butter? Hi Jenna, I’ve been meaning to try. I *think* it should be fine. One of the people in my Lunch Prep Challenge used a No Nut Butter and said it worked well. Is there anything else you could sub for the nut butter, besides the Sun Butter? Hi Allison! I’ve never used it myself, but one of my Lunch Prep Challenge participants used a no-nut butter. Not sure exactly which brand. Other than that, I’m not sure of what else you could use. Wow Butter (soy based) and Almond Butter are our go-tos. Here’s a tip I use: I have a coffee grinder (from Goodwill for $5) that I use to grind up whole Flax seed. It works wonderfully and you’ll always have some fresh ground flax seed around. If you store flax seed. I add it to my dogs food for itchy skin and a shinier coat. My dogs don’t mind it at all. 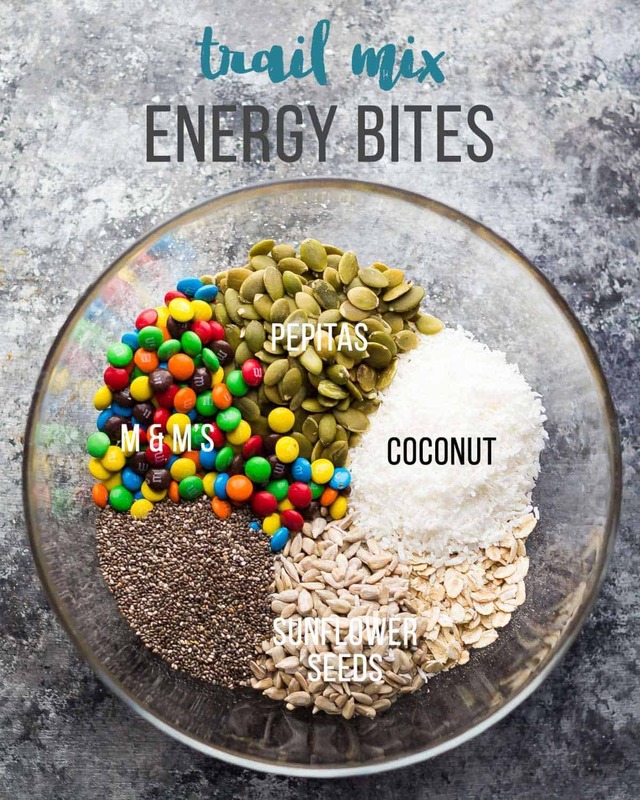 I’m going to try some of these energy bites. They sound so yummy. That’s a great idea Mary! Ben came home with whole flax seeds a few weeks ago and I used my blender to grind them up. It seemed to work well too! Can’t wait to make these. However, all of them look amazing and it will be hard to pick which ones to start with first. Is there any kind of carb or calorie range info for these? 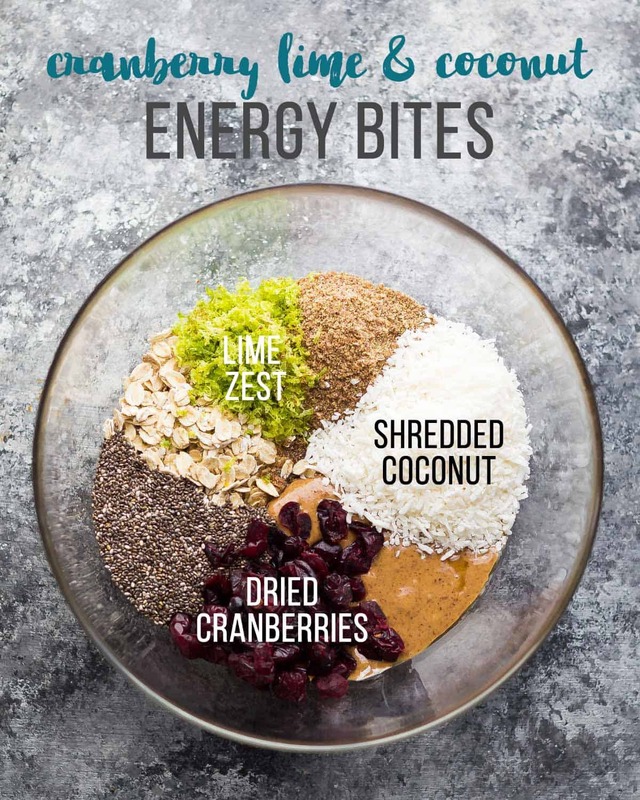 Hi Libby, I hope to add nutritional information to these recipes soon, but I did put the cranberry energy bites through My Fitness Pal and got 116 calories and 11g carbs per serving. I hope this helps! How many are a serving? Hi Taylor, each recipe made slightly different number of energy bites. That information should be on each recipe card. Great tip Lynn! My nut butter was pretty liquidy so I didn’t need that but especially if your nut butter is quite solid that is a good idea 🙂 Happy New Year! Wow, these are impressive! 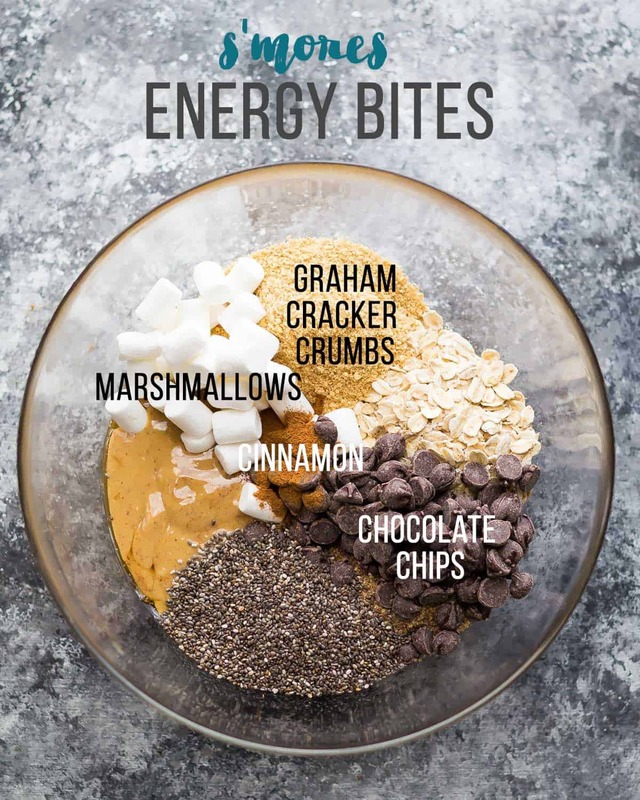 I have a serious weakness for snacks too and usually just end up with a bag of chips, so I could really use some of these energy bites in my freezer! I especially love the carrot cake ones!